Wildlife rehabber Gail Bembenek holds newly arrived baby rabbits. Photography by James Jones. At the end of a quiet, dead-end street in Westerly, a three-story brick house is surrounded by a maze of shed-like structures that seem only slightly out of place. The largest is forty feet long and twelve feet tall and sheathed almost entirely in wire screening. Inside, lying on a tree stump, is the carcass of a half-eaten squirrel. And perched on a beam above the carcass are two female red-tailed hawks: Griffin, a seven-year-old with a deformed beak, and Matrix, fifteen, who has a traumatic head injury from being struck by a golf ball at a country club in Massachusetts. The two birds periodically fly the length of the cage to exercise their wings, and then swoop down to peck at the squirrel carcass. Every year, one of them lays an infertile egg, and the birds take turns incubating it until they realize it’s not going to hatch. Adjacent to the flight cage are a dozen eight-by-ten-foot cages. In one sits a turkey vulture named Lurch with neurological damage caused by ingesting something poisonous at the Charlestown landfill. Next door is Krypto, a peregrine falcon born on the Superman building in Providence but who flew into a window of the downtown Blue Cross Blue Shield building, breaking its wrist and causing a head injury. Nearby, two barred owls perch in a darkened section of their cage, one-eyed Wink and his partner, Boytoy, who was rescued after being struck by a car. The newest cage, built last year with the help of a local Eagle Scout, houses a red-tailed hawk that struck a window so hard that the homeowner thought it was a gunshot. Most of the birds at the nature center have permanent injuries and would not survive in the wild, but some are destined to return to the outdoors when they heal. The Maxsons started Born to be Wild after taking a wildlife rehabilitation class through the Rhode Island Department of Environmental Management (DEM) and apprenticing with a certified rehabilitator. “All it takes is one or two enjoyable cases, and it strengthens us and keeps us going,” adds John. The Maxsons have become the state experts at rehabilitating raptors, so almost every hawk or owl in Rhode Island that is found injured or unable to care for itself usually finds its way to their nature center. Every day, they provide the birds with their preferred meal — dead mice and rats for some, squirrels and rabbits for others — and assess the health of each to determine when they are ready for release. When they have time, the Maxsons also host tours of the nature center or bring some of the birds to summer camps and retirement homes for educational programs. About seventy hawks and owls spend time at Born to be Wild each year, and about 65 percent survive to be released, a better success rate than the national average. Some must be euthanized because of the seriousness of their injuries. According to John, the most difficult hawks to care for are ospreys. Just nineteen licensed wildlife rehabilitators reside in Rhode Island to care for the more than 5,000 animals that are rescued each year by local residents, animal control, DEM officers and others. Most of the animals are baby songbirds, squirrels and rabbits, whose mothers have been attacked by dogs, struck by cars or, in the case of the squirrels, had their nest tree cut down. But just about every type of animal that can be found in the state eventually shows up on the doorstep of a local rehabilitator, including bats, ducks, opossums, chipmunks and mice. Last year, rehabilitators stabilized their first two baby river otters and, a few years before that, a beaver. Kristin Fletcher, executive director of the Wildlife Rehabilitators Association of Rhode Island, says that until the early 1990s, all wild animals brought to a veterinarian in the state were ordered to be euthanized due to requirements that said only people with a state permit could rehab them. But in 1992 a group of wildlife enthusiasts, including Wickford veterinarian Meredith Bird, worked with the state to establish a rehabilitation system to protect the lives of injured animals. Several steps are required to become a rehabilitator, beginning with completion of a six-hour training session and house inspection that allows interested Rhode Islanders to be a “sub-permittee” and assist a licensed rehabilitator. After twenty-five hours of hands-on training, further training and passage of a test administered by DEM, individuals may establish a rehabilitation facility at their home, which must first be inspected by DEM to ensure it meets minimum standards. Additional training and testing is required before a Level One certification is issued, and even more training is necessary to be allowed to handle animals that may transmit rabies. 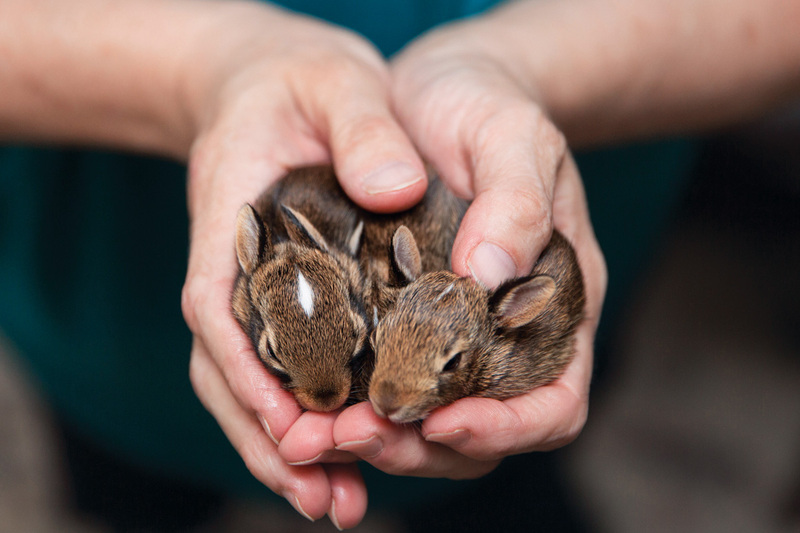 Gail Bembenek rehabs baby rabbits then releases them back into the wild. Photography by James Jones. Gail Bembenek rehabs baby rabbits, squirrels and opossums in her dining room, then releases them back into the wild. Photography by James Jones. John Maxson, with his wife, Vivian, rescues and rehabilitates birds of prey like this barred owl. Photography by James Jones. John Maxson, with his wife, Vivian, rescues and rehabilitates birds of prey. Photography by James Jones. John Maxson. Photography by James Jones. Those that complete the licensing requirements must be prepared to foot the bill themselves for cages, food and other expenses involved in caring for wild animals. While the Wildlife Rehabilitators Association provides medication and veterinary care, it relies on donated funds to operate. The first stop for most rescued animals in the state is the Wildlife Clinic of Rhode Island in North Kingstown, which was built in 2015 behind the home of an association supporter. The facility is lined from floor to ceiling with cages containing a wide variety of animals in various stages of healing, and adjacent cabinets are filled with prepared foods labeled monkey chow, rodent block, game bird crumble and turkey pellets. Last March, shortly before the busy season began, birds appeared to rule the roost: a herring gull with a shoulder injury peers out from one cage, a disheveled-looking ring-billed gull struggles to groom itself in another, and smaller cages contain a blue jay, cardinal and robin. Around a corner, an opossum recovers from a dog attack, and several turtles with damaged shells swim in an aquarium. In an adjacent building, donated playpens await baby skunks, woodchucks or ducklings, a wading pool holds a large snapping turtle, and other containers are available for whatever needs arise. According to Arianna Mouradjian, the clinic director, an injured animal is usually delivered by the individual who found it, or arrangements are made to have a volunteer pick it up. That’s when the real work begins. In consultation with Dr. Bird, who handles severe cases, and Dr. Chi Chan of South County Traveling Vet, who conducts day-to-day rounds, treatment plans are developed for every animal that arrives at the clinic. Those with ongoing medical needs — like the goose that required daily foot baths in disinfectant due to a severe wound from fishing line wrapped around its leg — remain at the clinic. But most of those that have received treatment and just need time to heal are delivered to in-home rehabilitators. Healthy baby animals separated from their parents go straight to the rehabbers, sometimes without even stopping at the clinic. Mouradjian, a former lawyer with a wildlife biology degree from the University of Rhode Island, manages a team of sixty to eighty interns and volunteers each year. She was a clinic volunteer herself while operating her own law practice, but she became the clinic director in 2014 after becoming disillusioned with the law. Captivity can be hard on wildlife, though, Mouradjian says. Waterfowl and raptors can develop bumblefoot — like bedsores on their feet — from standing around all day. And some animals can get depressed.